At the beginning of the game, Abyssinia can attach Prototype Assets to units in the company. These Assets, unlike most, can't be used to reduce damage, but they do lend extra actions to the unit they are attached to. 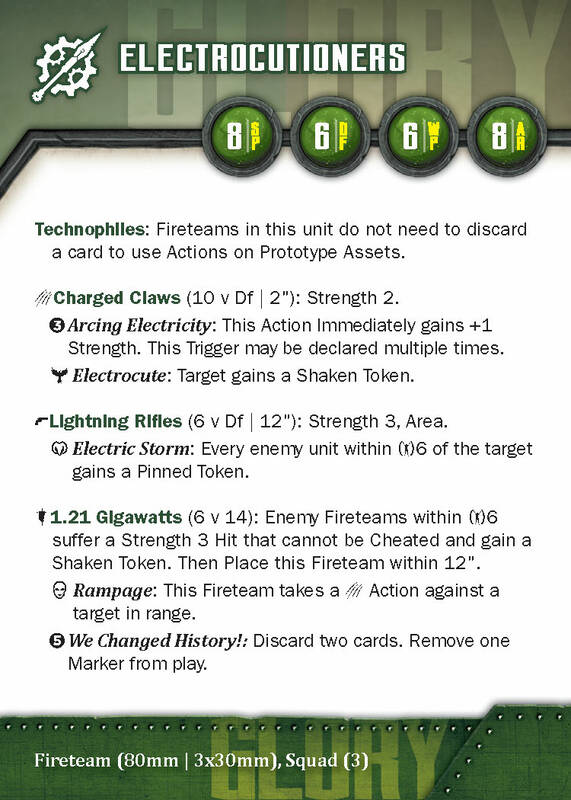 Add in that they have a powerful card draw Trigger on all their Actions (meaning the Electrocutioners actually have three suit triggers!). and you can ensure your fighting force stays in tip-top shape. It is worth noting that Triggers can only be declared on a success, so if you fail the duel, you do not get to draw a card. Going into Glory for them is a matter of great success, needing a Margin Value of 6 to declare the Trigger. This is no easy feat, as your opponent will try to thwart you at every turn. Below are the Prototype Assets. Prince Unathi is a well-balanced battlefield Commander. Field Test allows him to make better use of Prototype Assets, and Call for Reinforcements helps him keep his soldiers alive. His only attack is the powerful Poison Rocket, able to do a Strength 2 hit to an area, and, with a good success, create a permanent piece of Hazardous Terrain. Upon going to Glory, Prince Unathi doesn't learn any new tricks, but he does become better at those he knows. New Triggers on his Actions give them extra potency, allowing his entire army to benefit from his switch to Glory. The Lord of Steel only has a Tactics value of 1. This isn't because he doesn't have a brilliant mind for battle, but rather that he often acts on instinct rather than detailed plans. His Spear of Ages is Soulstone powered, giving it incredible cutting power. Coupled with a Morale Action for extra movement (and Speed 9), and it is possible for the Lord of Steel to attack from 38" away (18" Charge, 18" Take to the Sky with the trigger, 2" melee). Obviously he is powerful on the front, but when he goes to Glory he only gains potency. His Speed and Armor are incredible and his melee attack only gains in effectiveness. Most importantly, however, he gains a ranged area attack in his grenade and a new trigger on Take to the Sky that gives in an extra melee action. 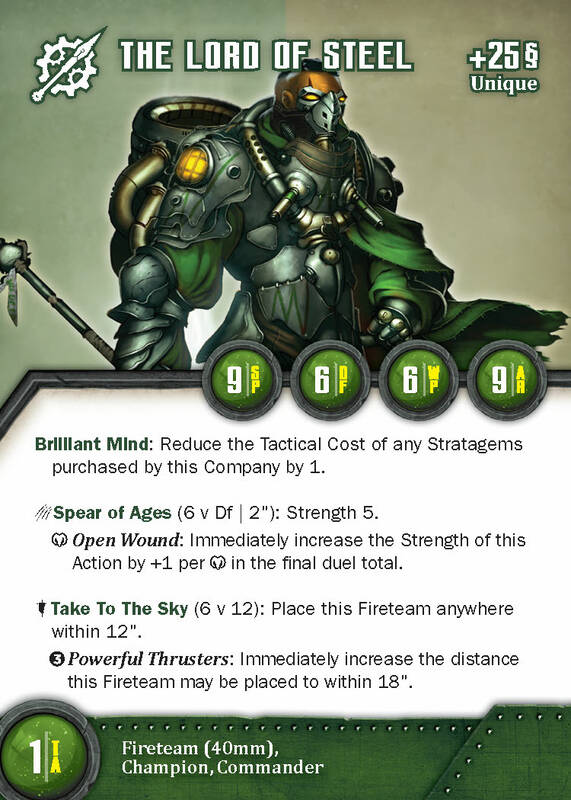 Combined, the Lord of Steel can potentially make two attacks per turn. With attacks like his, this can be devastating. Kassa Okoye is an engineer, who will keep your Titans running, and increase their power significantly. Her Spare Parts gives you resources when systems go down on Friendly Titans, and her Divert Power makes them more powerful. Using her Modified Machine Gun she can also keep the enemy at a distance by providing pinned tokens and putting out some damage. Upon going to Glory, Kassa is able to repair the Titans she wants to bring. If, despite her best efforts, a Titan does go down she can immediately grab one of her Stratagems to punish the foolish enemies who would strike against her machines. These are Abyssinian scouts that help pave the way for the entire army. Quick on the battlefield because of Scout Ahead, the Crow Runners are able to lay down fire or mix it up in melee. While not flashy, their speed and adaptability mean that they are a vital help on the battlefield. They can shore up weak spots, go after objectives, or put the hurt on their enemies. Desiring to stay near their Commander, the Mehal Sefari are always ready to lose their lives for their leaders. An incredibly Armor 8 makes them able to withstand many shots, ensuring there is no easy target for enemy attacks. Their Machine Guns give them a great firebase, and the Trigger means they can further help protect their leader. The Takoba is a potent Strength 4, ensuring that they have a chance at bringing down any target they must confront. Meet the mighty Electrocutioners! Using Soulstone powered electricity, the Electrocutioners are happy to engage at range or in melee, bringing cutting edge Abyssinian technology to the battle. Charged Claws are a respectable Strength 2 at an AV 6. Their triggers give them the ability to hand out shaken tokens, or to more easily gain bonus Strength. Their Lightning Rifles are less powerful, but have a great 12" range and the Area effect, allowing them to punish an opponent who groups up. The Basotho Cavalry benefit from having a low Scrip cost and being fast. Their Speed of 11, and Light Cavalry rule ensure that they can get wherever they are needed on the table. Their Supressing fire will have the opposite effect for the enemy. Being able to hand out a TON of Pinned Tokens means the enemy will struggle to get where they need to get. The Mechanized Infantry with their Walker Titan are able to dish out a respectable amount of damage with their Machine Guns and Battle Cannon. While they are able to hold their own in melee, they prefer to stay at ranged where they can take advantage of their powerful triggers. By using Veratile Tactics the Walker will be able to use it's powerful Relentless Assault trigger to dish out even more damage, while it's Shielded ability keeps it safe from return fire. Compared to their brothers and sisters in the Mechanized Infantry, the Steel Legion much prefer to mix it up in melee. Their Buzzsaws have an incredible Strength of 5, an AV of 7, and give out a Shaken Token. Their Cutter Titan wades into combat with them wielding it's set of powerful Buzzsaws to deal out death. The Rail Gunner is equipped with one of the most powerful ranged weapons of the Abysinnian arsenal. Boasting an impressive range of 30", plus a Strength of 3 that goes up quite easily with the Powerful Shot Trigger means the Rail Gunner will be handing out some hurt from quite a distance. The Marauder allows two Abyssian soldiers to work together to harass enemy Units. Their Heavy Machine Gun, Two Seater ability, and Speed of 9 means they will be able to fly up the board and get some shots off on almost anything. There will be no hiding from the Marauder. The Abyssinian Engineer is able to be placed into any Unit to give them a little buff. Their Prototype Shield Generator ensures that you will be able to more easily use your cards, while their Experimental Rifle will provide a powerful ranged attack that ignores Cover.